Copper pipe is commonly used for under-sink water supply lines both in the kitchen and in the bathroom. However, most sinks on the market are equipped with flexible stainless steel hoses that drop down from the beneath the faucet assembly. The most common way to connect the stainless steel hose to the copper pipe is with a dielectric union and a plastic piece of extension tubing or a coupling. Turn off the main water supply under the sink by turning the water control valve fully to the left. 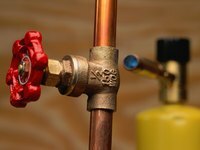 Remove any hoses or tubing attached to the copper water supply line with the pipe wrench. Screw one side of the dielectric union onto the threaded end of the copper pipe. Stretch the stainless steel water line from the bottom of the faucet connection to see if it reaches the dielectric union attached to the copper pipe. If so, connect the end of the stainless steel braided hose directly to the dielectric union and tighten with a pipe wrench. Connect one end of the extension tubing directly to the dielectric union if the flexible line coming from the sink is not long enough to reach. Connect the other end of the flexible tubing to the braided stainless steel hose. Tighten the connections with the pipe wrench.